Our TSO Beaumont eye care center was originally located on Concord Ave under the management of Dr. Solomon. It later moved to Parkdale as one of the original tenants of the mall when it opened in 1973. It was one of the first TSO offices ever established. Fresh out of school in 1981 Dr Blount joined the Parkdale practice as an associate optometrist. His caring attitude toward his patients, love of music, and humorous nature, combined to make a great chairside manner. Dr. Blount bought the existing TSO practice in the early eighties. For 18 years, he worked as a sole practitioner, building the practice year after year with his caring nature and chairside humor. Some of his patients have been seeing him annually for more than 30 years, and have become more like friends and family than patients. Dr. Kimball was a young middle school student in Jasper when she met Dr. Blount; shortly after he began practicing optometry. She was impressed by his knowledge and caring attitude toward his patients, and he encouraged her to consider optometry as a career. Little did anyone expect that fifteen years later, she would join his practice as an associate optometrist, and eventually become his partner. In 1996, Dr. Blount’s practice was bulging at the seams, when by a chance encounter, he ran into his old friend Dr. Kimball again, and offered her an associate position with the practice, with a potential for partnership. Within a few months, Dr. Kimball had loaded up the truck and moved to Beaumont. In early 1999, the new partnership moved the practice to its new location on Dowlen Road. To build their vision of the best equipped optometric office in the region, Drs. Blount and Kimball began equipping the practice with the most advanced technology while keeping their style of patient care that is full of heart and a focused on listening to each patient’s needs. Soon the new office had 3 fully equipped exam lanes, exciting new technology to allow for advanced retinal imaging, the newest visual field technology, ocular coherence tomography, corneal topography, autorefractor. 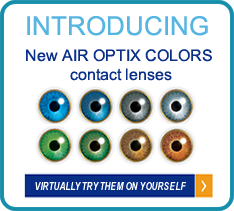 They also embraced new contact lens technology as it evolved and now have the widest variety of contact lens options imaginable.